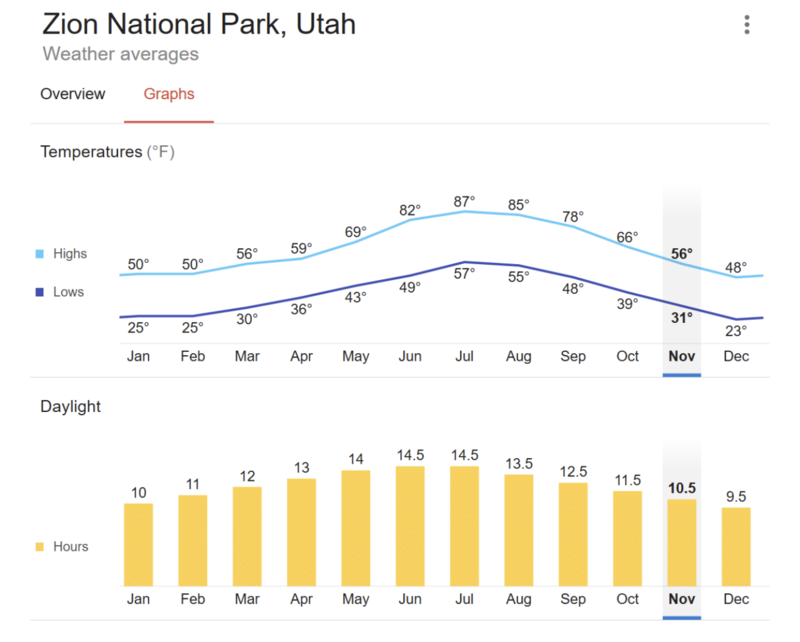 Why did Zion National Park see 4.5 million visitors last year? You have to see it to believe it that’s why! Millions of years of the Virgin River cutting and carving through beautiful red and white sandstone create some of the most interesting rock structures and slot canyons in the world. According to National Geographic it is the 3rd most visited park in the United States. Private Vacations offers private homes, townhomes and resort condominiums all within a 30 minute drive to the Zion Park entrance. Definitely the best campground when it comes to location, large camping spots and views. Your group will enjoy large trees providing shade and facilities onsite. The spots turn over quickly so you will have a good shot at finding a spot. If you want the chance to stay at this beautiful location you will need to make sure to make your reservations 6 months in advance. 94 of the campsites provide electrical hookups about 69 of the sites are for tents only. They also offer group sites that can sleep up to 40 guests. If you are looking for an RV option, look no further. Clean sites, Wi-Fi, showers, restrooms and pet areas. They also offer shuttle services to the park. If you want to stay overnight in the backcountry up the Virgin River and its tributaries you will need to purchase a permit. Permits can be issued through the visitor center the day before or the day of the hike. Enjoy a 22 minute video that plays every half hour to learn about the parks history and geology. There are both temporary and permanent exhibits. If anything it is a great place to fill up your hydro flask before your next adventure. The short answer is yes. However, it is very limited with lots of restrictions located here. The only trail you can take a pet on is the Pa’rus Trail, all the other trails are no pets allowed. If you have a service animal you are allowed on the other trails but bring your documentation because they will most definitely ask for it. How to access: Shuttle or car. As the most renown hike in Zion National Park, Angel’s Landing is true to its reputation. If you are an avid hiker looking for adventure and great views of the park, this trail is not to be missed. 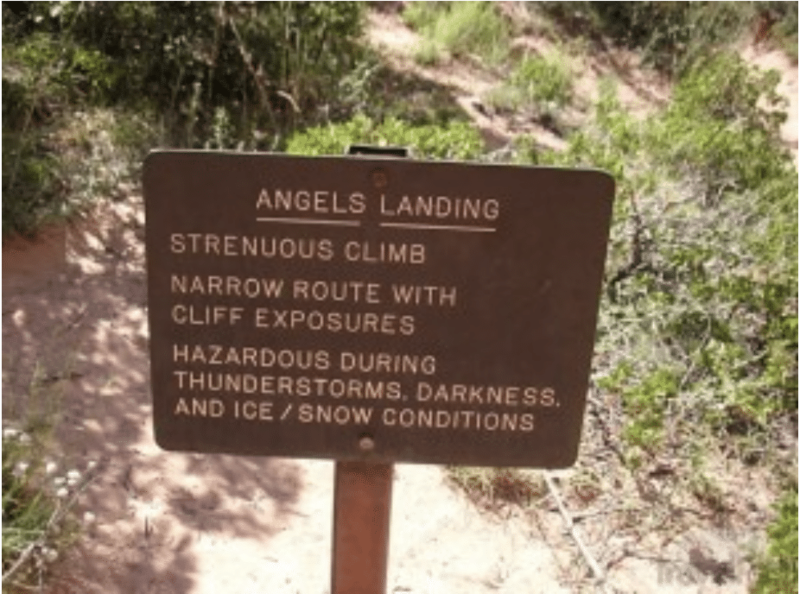 Angel’s Landing is a 5-mile round-trip hike that begins at the Grotto Trailhead, right across from the Grotto picnic area. The trail starts out relatively flat and level until you enter scenic Refrigerator Canyon named after the cool and breezy walkway created by shade. Once in the canyon, you’ll walk up a series of switchbacks called Walter’s Wiggles that take you out of the canyon onto Scout’s Lookout, a ridge that goes along the Saddle. This is where the difficult stretch begins. After crossing the Saddle, you will encounter Hogsback – an incredibly steep and narrow climb (chains are bolted into the mountain for safety and assistance – you WILL need them). 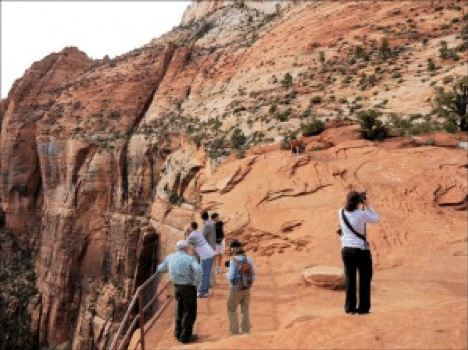 It is after finishing this treacherous stretch of trail that you are rewarded with the best view of Zions – Angel’s Landing. Once there, you can sit under the shade of hardy trees, take pictures, and just relax – you’ve earned it! You’ve just climbed roughly 1,400 feet in elevation in only 2.5 miles. This hike is best for experienced hikers who can handle heights with no problem of vertigo. Avoid hiking during the winter as ice will make the way too dangerous and slick. 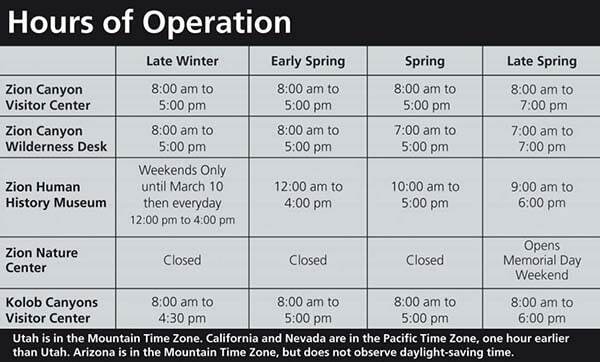 Also avoid summer afternoons (though mornings are mild enough). Hikers are not permitted to hike during lightning storms, so watch the weather forecast. Drinking fountains and restrooms are available at the Grotto, located at the base of the trail. Bring snacks and drinks (you’ll need them), but make sure you can pack them in a backpack as you’ll need your hands free once your get to Hogsback. 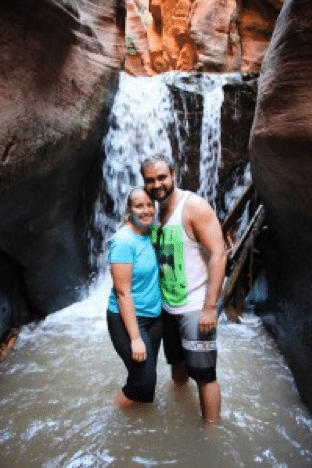 People come from all over the world to see Zion National Park. Angel’s Landing is just one of the many reasons why. 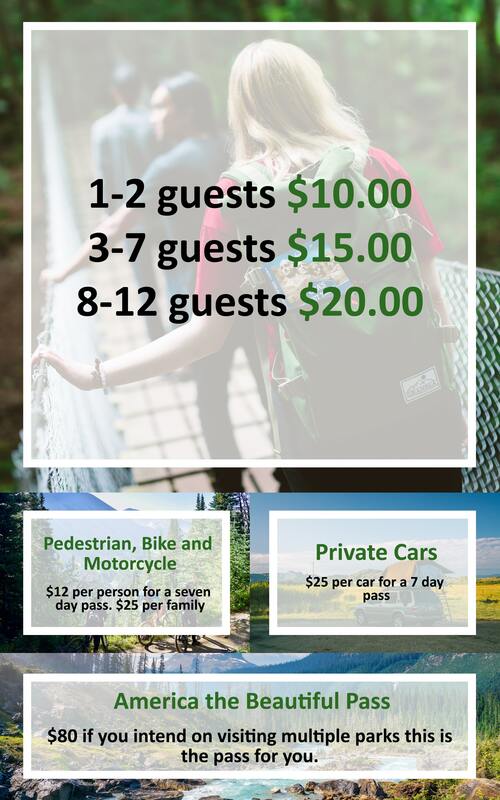 So dust off your hiking shoes and head out for a few training hikes to prepare for the best trail Zions has to offer. Don’t forget your camera, you’ll quickly see how this spot earned its name. Consider hiking the Canyon Overlook Trail. Perhaps the best introduction to Zion’s National Park, the Canyon Overlook trail is easily accessible (no shuttle required, street parking) and offers the best “bang for your buck” you’ll find in the park. Though the trail itself is only 1 mile round trip, the elevation gain is substantial which makes the short jaunt feel like a real hike. Also, the hike winds around the mountain, through naturally carved out walls that create a stunning visual experience all along the way. True to its name, the trail ends at a cliff drop off (surrounded by protective rails) that overlooks Zion’s lower canyon. From there, you can see Zion’s famous Switchbacks, the Beehives, West Temples, East Temple, Towers of the Virgin and the Streaked Wall; the view is glorious and completely worth the short hike. For logistics including trailhead location, conditions, etc. See the Canyon Overlook Trail Page on the Zion’s National Park website. Best photo op time: 3 hours before sunset at the waterfall. Access: Drive to the parking lot there is a fee booth and the hike in is 1.5 miles. Below are some tips about slot canyons in general and some specifics of our exciting hike up Kanarra Creek Canyon. Location: Kanarra Canyon is located east of the town of Kanarraville, just south of Cedar City. Exit off I-15 and drive to the center of the small town. Follow 100 North as it winds east and becomes 250 North this will lead you to the mouth of the canyon. Limited parking is available at the end of the dirt road near the stream – you may have to backtrack to find a parking spot and then hike down the road to the creek-bed. 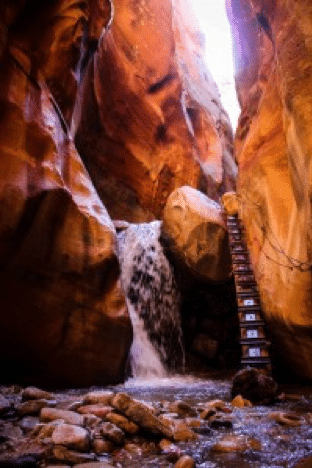 Slot canyons are at high risk for flash floods. It is important that your group checks current weather forecasts frequently. Do not try to gamble on the weather. If there is rain or a forecast for rain do not attempt this hike. It is also important to wear the right clothes for this hike. Wear waterproof shoes or neoprene socks to keep your feet protected and warm during the hike. Watch where you step, during the hike you will be crossing the stream and sometimes walking up the riverbed. If you are hiking Kanarra Creek you better bring a camera along for this beautiful slot canyon hike. It might also be a good idea to bring a dry bag for your cameras and phones during some of the steam-bed walks. Access is easy, the hike is relatively short and the route can be customized to keep it easy or make it a little challenging. Our first adventure came when we met up with two waterfalls that blocked upstream travel through the narrow slot. Water flows year-round and we waded the stream in many places. The hike to the base of the first waterfall was short and easy. We were up to the adventure and we climbed up the falls to continue the hike. At some spots in the hike we used some of the man-made ladders made out of logs and metal rungs. This ladder was very safe and there were also rope handrails on the cliff walls to help balance. After the first waterfall we found a fun swimming hole with a mossy rock slide. It was a great place to take some group photos and continue with the hike. We made it to the third waterfall to find that the ladder was broken. We did not have the proper climbing gear and so we decided to head back. This hike was incredible! I would recommend it to anyone staying in the Cedar City/ St. George area. Whether you’re visiting Zion National Park with family, friends or group/corporate travel, you will always find yourself in awe of the landscape and scenic beauty. This guide was an effort to provide valuable information for travelers all in one place. As a reader if you know of any hidden gems or would like to share your experience email us at relax@privatevacations.com.